NEW YORK/LONDON (Reuters) - Oil prices rose on Thursday but fell as much as 35 percent for the year after a race to pump by Middle East crude producers and U.S. shale oil drillers created an unprecedented global glut that may take through 2016 to clear. Global oil benchmark Brent and U.S. crude's West Texas Intermediate (WTI) futures rose between 1 and 2 percent on the day on short-covering and buying support in a thinly traded market ahead of the New Year holiday. But for 2015, both benchmarks fell double-digits for a second straight year as Saudi Arabia and other members of the once-powerful Organization of the Petroleum Exporting Countries (OPEC) again failed to boost oil prices. The U.S. shale industry, meanwhile, surprised the world again with its ability to survive rock-bottom crude prices, churning out more supply than expected, even as the sell-off in oil slashed by two-thirds the number of drilling rigs in the country from a year ago. The United States also took a historic move in repealing a 40-year ban on U.S. crude exports to countries outside Canada, acknowledging the industry's growth. "You do have to tip your hat to the U.S. shale industry and their ongoing ability to drive down costs and hang in there, albeit by their fingernails," said John Kilduff, a partner at Again Capital, an energy hedge fund in New York. Brent crude settled up 82 cents at $37.28 a barrel, rebounding from a near 11-year low of $36.10 hit earlier in the session. For the month, it was down 16 percent and for the year, it fell 35 percent. In 2014, Brent lost 48 percent. WTI rose 44 cents to $37.04 a barrel. It slid 11 percent in December and 30 percent for the year, after a 46 percent loss in 2014. The immediate outlook for oil prices remains bleak. 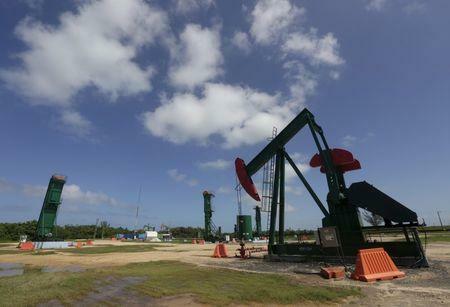 Goldman Sachs has said prices as low as $20 per barrel might be necessary to push enough production out of business and allow a rebalancing of the market. Adding to oil's woes, floods across the Midwestern United States were threatening refineries and pipelines from Illinois to Louisiana, potentially swelling the glut of domestic crude at a time when stockpiles were already at record highs. A mild winter so far in the Northern Hemisphere due to the El Niño weather phenomenon has also slashed demand for heating oil. U.S. heating oil prices fell 40 percent for a second year in a row. "We have brimming oil inventories in Europe," Bjarne Schieldrop, chief commodity analyst at SEB in Oslo, said. "And our predictions are that oil inventories in Asia are going to get closer to saturation in the first quarter." Morgan Stanley said in its outlook for next year that "headwinds (are) growing for 2016 oil." The bank cited ongoing increases in available global supplies, despite some cuts by U.S. shale drillers. "The hope for a rebalancing in 2016 continues to suffer serious setbacks," it said. Brent prices briefly hit a 2004 bottom below $36 a barrel last week, effectively wiping out gains from a decade-long commodity super-cycle sparked by China's once-inexorable growth and energy demand boom. The downturn in oil has caused pain across the energy supply chain, including to shippers, private oil drillers and oil-dependent countries from Venezuela and Russia to the Middle East. Analysts estimate global crude production exceeds demand anywhere between half a million and 2 million barrels a day. This means even the most aggressive estimates of expected U.S. production cuts of 500,000 bpd for 2016 would be unlikely to fully rebalance the market. Oil began falling in mid-2014 as surging output from OPEC, Russia and U.S. shale producers outpaced demand. The downturn accelerated at the end of 2014 after a Saudi-led OPEC decision to keep production high to defend global market share rather than cut output to support prices. OPEC failed to agree on any production targets at its Dec. 4 meeting in Vienna, cementing its decision to protect market share, as the world braces for the return of Iranian crude exports to the market after the lifting of Western sanctions against Tehran. Russia is also showing no signs of reining in production, prompting traders, hedge fund managers and other speculators to establish record high active short positions in the market that would profit from further crude price falls.